The storefront where Zak Kostopoulos tragically lost his life in Athens. "Justice for Zack(ie)" has been echoing in the streets of Athens since the 21st of September when a LGBTQ+ activist, anti-fascist, and HIV-positive, Zak Kostopoulos, was violently murdered. His death was committed by a jewelry shop owner and his friend with the assistance of the police, as an act of self-defense from “armed robbery”. Zak was not only a victim of a systemic outburst of violence that targeted his distinctiveness, but also a victim of fascism and social indifference, two flourishing phenomenons within the civil boundaries in the conservative nation of Greece. Zak spent his life advocating for freedom of self-expression and identity. He was born in the US to Greek parents in 1985 but later moved to Greece and studied theatre and marketing there. He came out to his parents around the age of 16. After being diagnosed with HIV during a voluntary blood donation while serving in the Hellenic army in 2009, Zak came across PositiveVoice, an association of ΗΙV+ people living in Greece. This marked the beginning of his open public dialogues about HIV and AIDS. He was also offered the position of advisor for HIV related issues and sexual health in Athens Check Point, an HIV prevention centre.He was president of the Homosexual and Lesbian Association of Greece, OLKE, and used to write for Antivirus Magazine and other zines. Zak was also a former candidate for Athens City Council in the Municipal Elections of 2014. In recent years, he emerged as a successful drag persona in the night life of Athens under the name “Zackie”. 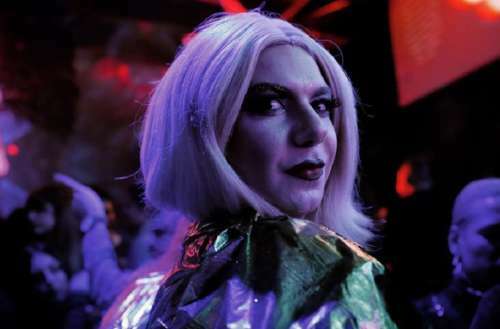 In drag or in his regular dress, at the front of a parade, at the front of a protest, at the front of a crowd, Zak would always stand up to bring people together, to defend the minority groups, and to advocate for their fundamental rights. Zak was a fighter and a defender of LGBTQ and human rights. During an interview Zak said "If it hadn’t turned out HIV-positive, I wouldn’t be what I am today and since I like where I’ve made it today, it certainly turned out well". Leading the life of an activist, Zak felt safer among migrants and foreigners than among Greeks. He took a firm stance against any form of violence or social repression. What truly happened to Zak Kostopoulos? On the afternoon of the 21st of September, a shop owner, his friend, policemen and passers-by represented indifference, violence and hate in the face of an egregious hate crime. It began when Zak became trapped at a jewelry shop by the plastic security door. He was thought and presumed to be a thief, and was violently hit to death by the shop owner and his friend. However, Zak was captured by the camera of a nearby coffee shop a few minutes prior to the incident, trying to avoid two other individuals who were trying to harm him. Later, during the investigation, a passer-by confirmed seeing Zak walking towards the coffee shop coming from the main street asking for help. During Zak’s attempt to escape the shop owner, the policemen began to assault him further. While he was barely able to stand and near death after the flogging, the policemen confined him and informed their headquarters that he was detained. He later succumbed to his injuries. Zak’s murder was interpreted by the media mostly as a “violent incident”, and did not refer to the murder as a crime by itself. While the shop owner and his friend both remain free, the media await for the toxicology exam results to conclude their narratives of the “dangerous individual” and “well-respected shop owner” that acted on defense of his property. Post crisis societal regression is not the reason that the majority of Greeks probably won’t identify Zak’s murder as such. TV personas began polls on whether Zak should have been assaulted or not. Law enforcement was promoting violence while racism and fear are strongly dispersing in public life. The average Greek couldn’t be expected to identify a “murder” in such a context, thus the narrative of accident will keep insulting Zak's memory. In my opinion, the right to assault a person is never given by law. It is given implicitly when members of a society define social behavior on the basis of moulded versions of normality. Greece is no less conservative than most eastern European states and perception enablers remain within the rule of the triptych homeland - religion - family. Racism, homophobia and nationalism are notions that deeply rooted within Greek beliefs and are structurally influencing policies that lead to systemic violence, societal dysfunction and the rise of populism, reinforcing the separation between “us” and “them”. Currently the investigation is focusing on the facts that Zak's DNA wasn't found on the knife and that he was not in search for money as the media have argued but was simply seeking safety. The District Attorney of the High Court has ordered an investigation regarding racist incentives and there is already an ongoing interal affairs investigation regarding the role of the police. Zak’s murder wasn’t an accident. It was an act of systemic violence. Systemic violence and indifference go a long way in Greece, whether it’s through law enforcement or by civilians. He was a victim of the inter-temporal threats which perpetuate and nurture fear and narratives of normality found in rules-based societies. This fear is being sustained and dispersed from the unbent conservative perceptions that rule public opinion, law enforcement and the established order. These elements make up a continuum of behavioral characteristics and norms that exist within the so-called rule of law and its derivatives. As a result, an exceptionally cold point of view and conception of “victim blaming” started taking shape, alongside an increasing distinctness of “otherness”. This notion of “otherness” is enhanced by nationalism, the media or mass trends, and is usually found in the smallest of events. Collective memory, a term used by historians, describes how our history accumulates in a pool from which we receive our behavioral standards from family and state. One of its derivatives is the perpetuating civic conservatism found within the structures of public life and behavioral norms. This continues to spur violence, death and ideas of nationalism even in 2018. Whether or not Zak was committing burglary, which seems very unlikely following the investigation, he was not, under no circumstances, posing a threat to the general public. On the contrary, Zak was the victim of a threatening situation which he was trying to avoid, and wasn’t able to seek protection. and there was no one left to protest. Fear is not necessarily the potential danger that awaits each one of us in a corner, it is, rather, a perception that is cultivated, assimilated and introduced into the sphere of our realities. By blaming the victim, we separate ourselves from the presumable threat, by avoiding standing out in a crowd and ways individuate ourselves from the widely approved lifestyle and cross the damned line which separates us from “others”. Societal conservatism and systemic violence can be countered only though a multilateral aprroach, a civil alliance, which ranges from institutional and political level to every school and every neighborhood. Public life can be safeguarded if we all trascend our behavioural constraints and exceed our current roles as members of a society that ''is what it is''. We shouldn't just let go, like Zack didn't and wouldn't. Zack/ie’s murder will require justice which cannot be gained without struggles, whether out in the streets or in the court. We must all make sure that what happened to Zak will reach those who struggle for societal justice. It must be a reminder of how the life of one person can matter to many. The battlefield in which Zak’s life was lost requires many of us, to be won. If collective action and solidarity do not overcome the conservative tide that has emerged, our societies will regress further into states of civil survival and embrace fear instead of active involvement.